Beard trimmer has its own place in grooming but shavers are the new thing that makes the grooming more attractive, easy and less time consuming. Among those shavers Braun had gain its advantage by giving the best shavers to its user with all new modification and development with time to time. After the series 7 shavers, Braun had launched series 9 and also, they don’t stop there but the changes from wet to dry, digital interface, style, charging and even the blades are the key highlight in this review. Not only a detailed description will assist you in the way but also the review will give you the reason to choose Braun Series 9 for your grooming and best performance when it came to shavers. As a matter of fact, this shaver is almost at the top of best shavers whenever there is a competition. Experts and consumer both like this shaver a lot. Is it really worth it? The most reasonable question when it came to Braun Series 9 shaver. Well when it came to performance and the value it gives to your grooming then it’s really worth it as, Braun have managed to go well than the series 7 but the only thing that lacks in Braun series 9 is metallic body. They have used somewhat metallic and tough plastic to cover the body but still its will never leave a finger print to give a nasty look. Other than that there is nothing that can shrink the value for your money as it have all the exclusive features to warm you up. Besides from the compact design we will rather discuss its features. When it came to cutting the hair then Braun have given you the best for its four shaving razer which never missed a hair. The two OptiFoils at both end of the shavers capture the hairs close to skin and those foils have hexagonal boxed cover over then which keeps the skin away from the blades and give you a smoothie friction. Next came Hyperlift and Cut trimmer which are only available in the Series 9 with dark golden color and cuts the flat lying hairs on your beard. At the end came a direct & cut trimmer that clean the hair from all the direction. The smoothness came around the skin when grooming the beard is because of fifth metal piece between a foil and hyper lift & cut trimmer. The power technology that keeps the power according to the density of the hair is SyncroSonic Tech and it’s really helpful for cutting the hair not pulling them. When denser parts came like chin hair the tech increased the power for better cutting. 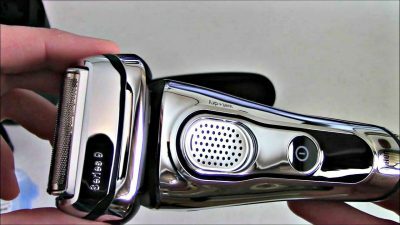 The unique feature of the Braun is to have pivot to revolve the shaver head in different direction which keep the shaver range to any directional cut and you can also fix the head and use the shaver in a specific direction. Another important thing is that it can be used in both wet and dry situation and now you don’t have to worry for being using it near your tub or in a bathroom. There is clean and charge station that lubricate the shaver and keep it in long loop of charging. There is LED display that shows the battery level and the maximum scale is 5 and also the shaver have travel lock. The shaver is also design. For the quick shaving people who are always late for the morning activities. When unpacking the shaver box you will not only see the shaver but there are few accessories that will assist you along your grooming which are Clean & Charge station, Charging cord, Hard travel case with cleaning system like brushes to remove stagnant hairs from the foils and also a user guide. The product is 6.2x6.2x9.9 inches in dimension and carries 2.08 pound weight. The oval head shape that contain four type of blades along with a thin rectangle metallic bar to keep the Braun surfing on your face. The body is plastic, somewhat metallic with black edgy strips around the power button and LED display. The head is movable to give different directional cut and the overall design is Ergonomic which fit easily in every hand for better performance and more grip. The performance is overall up to the standard as it gives you the exact shave you want. The ergonomic style keeps the shaver in good hands. 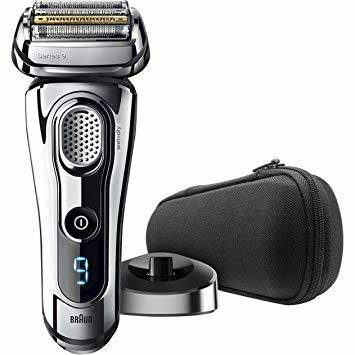 The revolving head can move up-to any direction and the most important is keep the five different shaving blades and there is not a single chance for a hair to cut loose. More, the power adaptability for denser areas makes Braun more appealing. The Braun series is designed for both wet and dry situation and due to that safety precautions are taken and made it Cordless. The battery takes an hour to complete charge and the charging life is shown with 5 LED lights on the shave each representing 20% charge. More there is quick five-minute charging to give you the instant shave with you short on time. Some models of the Braun shaver show numbers instead of LEB bar lights when it came to getting shutdown. Thar’s all about this best shaver for men. It always stays on the top whenever there is a debate about men’s shavers.